Standard non take-apart Kerrison Rongeurs accumulate blood and debris in the working channels behind the visible distal end. 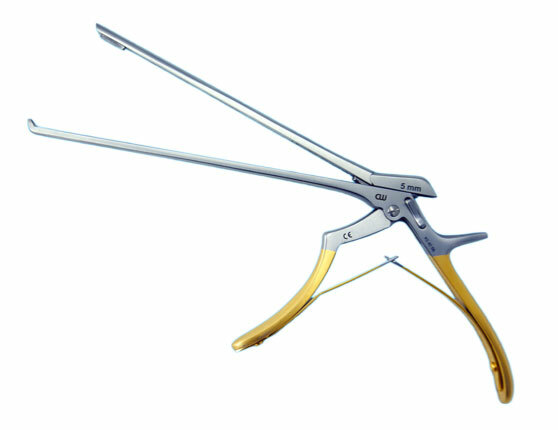 During surgery, as the Rongeur is moved repeatedly from the open to closed position, blood and debris is drawn into a pocket in the lower channel. 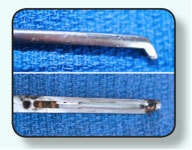 Since access to this pocket is virtually impossible for proper cleaning, the debris could end up in the next patient! Simply “Click” the upper slide lock release button to expose the channel areas for easy cleaning! 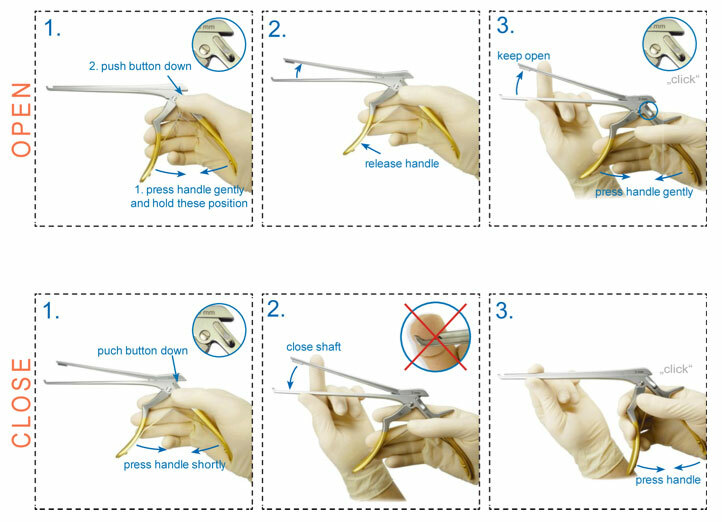 All parts are remain together and cannot be lost, ensuring easy assembling after sterilization. 1. Press handle gently while pushing down the button. 2. Release teh front part of the handle and keep the button pushed. The upper shaft is unlocked and can be slid upward 3. Keept he shaft open and press handle once again. The shaft closes with a "click". The shaft remains open and the instrument can be sterilized in open position. 1. Press handle gently and push the button. 2. The shaft is unblocked. Push the upper shaft downward into the track. 3. Press handle shortly. The shaft is locked with a "click" and the instrument is ready for use.